Diggin The Shelf also known as diggin.pl is a place in wirtual space where people with passion to dig the best, not mainstream music gather together. This is the place for all the conscious people who except listening to the music – like to talk about it. Diggin Fest is an event promoting the idea of Diggin. Fest was held already in Wroclaw, Krakow, Poznan and Warsaw. This year is our time! The second day of the Fest is hosted by well known Soul Confectionery series- so you can expect funk/soul/nujazz/disco and everything with funky groove. 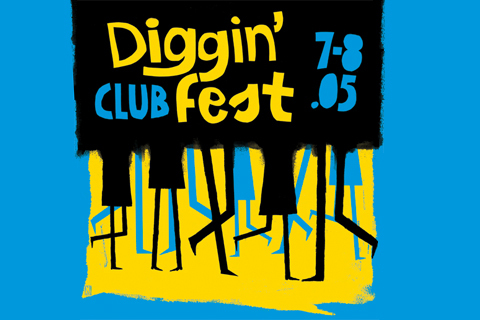 The guests of the Diggin Fest are: Nik Weston [Mukatsuku rec,London], Animisiewasz [Piekni Chlopcy, Krakow], Eltron John [Krakow], Strictly Business [J-son & Funkoff, Warsaw], Dj Boogie [Funky Sweepers, Poznan], Kuki Monstah [Soul Confectionery host, Lodz], Dj Late [Radiofonia, Krakow], Dj Greg [Lodz]. The canvas will be painted by Etam Crew and the visuals will be videomixed by Jerem. Nik Weston, dj, vinyl records freak, the owner of Mukatsuku label. Our special guest is a specialist from japanese jazz. As a music producer – he is a half of Guynamukat duo. Because of his japanese jazz fascinations – he has been touring Japan already 13 times. He has played his music in almost 30 countries until now. It’s not his first visit in Poland as well. His series of parties called Mukatsuku were nominated for the series of 1997 by The London Evening Standard. About the series you could read in The Face, DJ, ID, Muzik, Sky and Blues & Soul magazines. He used to lead a radio programm in BBC radio 1. He is also running a programms Forwardbackwards in Milkaudio and Konnichi Wah Wah together with Dom Servini in Samurai Fm.